My boss at Sodexho always said "We don't know our costs." whenever the food cost percentage was too high. Generally, the remote site feeding business should be very predictable. Patrons live onsite and have zero options outside the dining room at the camp. If a room is occupied for a night, we'd expect the resident to show for breakfast, lunch and dinner. Straight forward revenue calculation involves the number of people in camp multiplied by the rate per person per day. Problems in this business segment occur at mature projects after contract renewal. Since the competition is fierce, operators look for every possible advantage. When responding to the RFP, the bidders try to gain a cost advantage over their competitors. If the camp is close to a urban area (close would typically mean a short flight), many of the residents leave on the weekend. Playing the game involves predicting the probability the Friday evening meal will NOT be attended. In addition, Sunday dinner attendees provide a full manday of revenue. Even weekend travelers provide an operator with revenue if they eat Sunday dinner (though no bed was made and breakfast and lunch were not consumed). Sounds like a bonus for the caterer. Many times, the initial bid prices have this favorable activity built into the price matrix. Now the bonus turns into a risky game. Bad weather, overtime pay opportunities and special events may keep residents onsite over the weekend even though the prices reflect more checkouts. Some of the best operators provide a fantastic Sunday night meal and advertise the menu during the week. All efforts are focused on a big turnout. When the residents do not leave as expected, Sunday costs per manday can be very high. A few years ago, Darden's stock went lower due to a major turnout at their all-you-can-eat seafood buffets. Higher patron counts actually hurt their bottom line. I have found many of my clients pushing menu items with ideal food cost percentages over 50% (some over 100%). It's tough to make a decent profit when you're not charging enough for your popular menu items. When my clients were wrong on the low side, they tended to be wrong on the most popular items. Savvy patrons recognize a value and order these lost leaders more frequently. Do you know your costs? Economic conditions are rapidly changing with worldwide demand for energy at an all time high and rising interest rates in the USA. Higher costs are functioning as a tax on discretionary income. Borrowers and drivers are paying a lot more for money and gas. Restaurant expenditures often depend on patron's discretionary income. With the home equity line of credit option disappearing rapidly, credit card expenditures will be tightly monitored by more consumers. Recently, I went for a walk on a Wednesday evening at 8 PM in my neighborhood. I passed by 4 restaurants and dining rooms had lots of available tables. The best of the four was a popular chain steak house concept. Let's try to put ourselves in the shoes of management. Last year, our example steak house had annual covers of 50,000 and sales of $2,000,000. Covers in the current month are off 30% vs. the same month last year. The current average sales per cover is $40 and management is studying options. One manager favors a 5% across the board cut in menu prices. The hope is to keep the drop in covers at 20% vs. last year. Sales would drop to $1,520,000 and the food cost % would increase 1.84% (to 36.84% up from 35%). 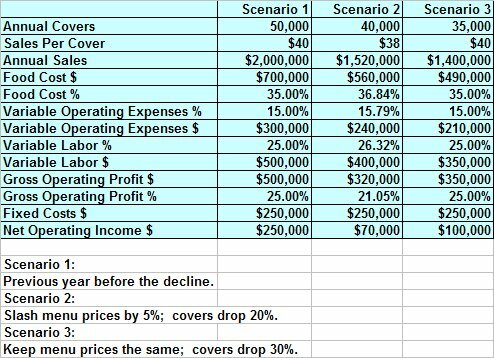 Labor expenses and other operating expenses are forecasted to hold at the current cost per cover. The general manager sees danger in the drop and favors holding menu prices at the current levels. So who has the better plan? Across the board menu price cuts are always risky. As covers decline, we would also see a drop in the contribution per cover. This is a very difficult plan to manage. I prefer the GM's solution. No menu reprint is required and there are plenty of tactical options available. Selective price drops may be implemented using specials to promote entrees using lower cost seasonal ingredients. Specific days of the week could be targeted for selective price cuts. As long as the covers on busy nights and busy seasons stay close to plan, the strategy will succeed. In our example, the GM's solution would produce a higher profit despite a steeper drop in covers. 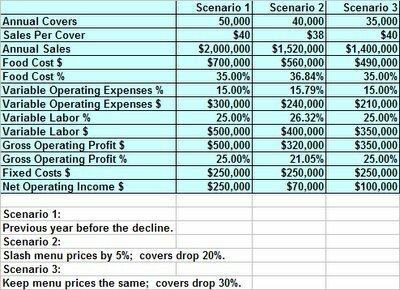 A 5% cut in sales per cover would not produce a bigger profit despite 5,000 more covers. The drop in sales per cover of $2 is not a simple to implement strategy. All income statement accounts would feel the impact. Waitstaff would see their tips per cover decline. Careful study is needed to predict the impact on your operation.